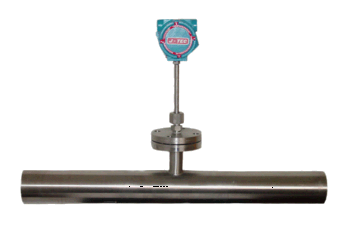 J-TEC’s Insertion-Style Mass Flow Meter is for measurement of engine intake air in pipes 3″ and larger. The desirability of improving the fuel economy and lowering the emission output of the internal combustion engine has necessitated a search for improved sensors to measure and control engine parameters. One of the key requirements is to measure the engine intake air. If this can be accurately measured, together with other parameters, then the job of the control system designer can be made easier. J-TEC’s Mass Flow Meter installed into a piping system will achieve accuracies of 1% over a 70:1 dynamic range. The built-in RTD and the pressure inputs into the microprocessor create the option for a self-contained mass flow meter. Unique vortex shedding technology, with no moving parts, reduces pressure drop and maintenance costs. Each meter is individually calibrated against NIST standards, giving you an accurate, reliable and economical meter for your money. J-TEC offers a customized tube assembly with air-horn inlet for 4” and 6” line sizes.